The Academic Edition includes extended interviews with patients and a special condensed excerpt designed to prompt discussion in lectures. The booklet features a review from the Lancet Psychiatry journal and Director's notes. Suitable for researchers and students of Global Mental Health, Visual Anthropology, Latino Studies and Documentary film making. The director lectures at Goldsmiths University, London. A PHD by Publication based on the film and book is in process. Free Skype Q&As are offered by the director for screenings at academic institutions. Note: Two copies of the DVD will be sent once ordered. Replacements available on request. DVD for institutions & non-profit organisations. Please click on arrow and select. Mexico is besieged by organised crime, drug cartels, corruption, and violence. Juarez is a city on the Mexican border renowned for its disproportionately high murder rate, where deaths go unnoticed and there are no convictions for the crimes. It has all the makings of a futuristic horror film; a lawless city with no infrastructure to protect its citizens, but this is real and the time is now. 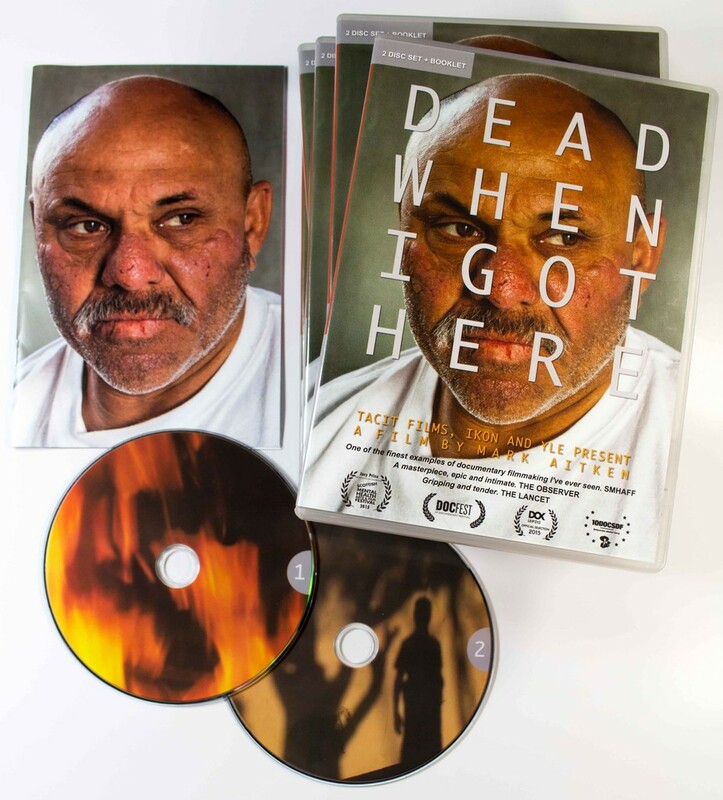 Documentary-maker Mark Aitken's film Dead When I Got Here is a gripping and tender account of Josue, a man who described himself as “already dead” when he was scraped off the streets and dumped at the asylum in Juarez. But this is an asylum run by its own patients, with Josue, once a patient, now managing the place. He has no formal training, but he practises a type of psychiatric care that comprises compassion, empathy, and personal experience. As the police collect a body of a 23-year-old man (death is a common occurrence here), they comment on the arbitrary nature of such an institution, stating that it sheds a “bad light” on Mexico's public health programme, and Josue can only shrug. It certainly does, but as this film shows, there is no other place for these disenfranchised people. The asylum is their sanctuary; a refuge for those with mental health problems. The asylum was founded by Mexican Pastor Jose Antonia Galvan. “I love Mexico, but not the Mexican system”, he says. Portrayed as a gentle and benevolent man, the asylum takes on a similar spirit. Those that are able help others, and a self-sufficient ethos, often claimed to be at the heart of the old asylum system, seems to operate here within a rudimentary and improvised setting. The cinematography is stunning, assisted by a climate that provides light and shadow, and dry winds that whip up the desert sands. Aitken captures a quiet unrest in the asylum grounds, but with minimal aggravation and disturbance, despite the severity of some patients' conditions. This is a film and the final cut is not always the whole picture, but even so the documentary does not feel staged. We follow Josue, talking, explaining, encouraging; telling his story again and again—dead when I got here, infested with gangrene, unable to walk, deranged, malnourished from decades of drug abuse—trying to find a way to reach the most disturbed and most desperate people. A consultant psychiatrist appears, presumably to prescribe the limited medication at hand, but here, where disability, drug abuse, and mental illness co-exist, recovery is not linked to release. For most, there is nowhere else to go. Many die here, without even knowing where they came from. Josue, resolute and compassionate, is a heroic figure, and his emotional fragility is disarming: his self-made family community is a painful reminder of the loss of his own family. There is redemption too: with help from the filmmakers, Josue is reconnected with the daughter he abandoned in the years of his chronic drug dependency. In this film, the true blood of humanity is fleshed out through a lens. Avoiding sentimentality, this documentary tells a story about insanity—a broken society, and its broken people still alive and kicking. Mark Aitken’s marvellous film takes us on a journey into a closed world where everybody has a terrible often brutal tale to tell and yet, within this seemingly hellish space, we find redemption and compassion in their purest forms. DWIGH shows the empowering ability of “outcasts” to create a home, be compassionate, support each other and share their wisdom with others. Josué inspires this, beating the odds that one can transform from a near hopeless and helpless situation to one of leadership and empowerment. This film also shows similarities of the occurrence, challenges, stigma and progression of people who suffer from mental ill health transcending cultures, geographical boundaries and heritage. This is a film with a heart that overflows with compassion and inspiration. A bold and searing portrait of an unlikely survivor, Mark Aitken's compelling documentary shows that 'life on the edge' can also be right at the heart of humanity. Made with integrity and compassion, DEAD WHEN I GOT HERE is a privilege to watch. Bathed in light despite the darkness of the subject matter and with a closing image as beautiful as anything you will find in Bresson or Tarkovsky, it is one of the finest examples of documentary filmmaking I've ever seen.